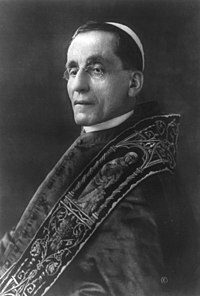 English: Pope Benedict XV, born Giacomo della Chiesa, (November 21, 1854 – January 22, 1922) was pope from 1914 until 1922. His pontificate was largely overshadowed by World War I and its political, social and humanitarian consequences in Europe. Deutsch: Benedikt XV. (eigentlich Giacomo della Chiesa) war Papst von 1914 bis 1922. Auf Grund seines engagierten Auftretens gegen den Ersten Weltkrieg wurde er als Friedenspapst bekannt. Pages in category "Benedictus XV"
Media in category "Benedictus XV"
This page was last edited on 16 November 2018, at 09:16.